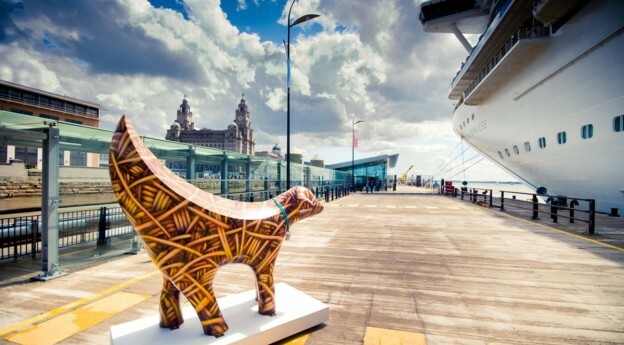 We manage and facilitate alongside berthing to visiting ships in the heart of the city, just footsteps from Liverpool’s UNESCO World Heritage waterfront. cruise ships to visit the city. We aim to exceed passenger expectations at every stage of their journey and change perceptions by ensuring guests experience Liverpool as the modern, thriving, dynamic, cosmopolitan destination we know it to be. We work hand in hand with partners to drive economic impact through spend in the leisure, tourism and retail sectors as well as drive business towards our own maritime sector. We bring positive, quantifiable and measureable change to the lives of people, the community, the visitor economy and perception of the city. passengers and crew and generated £72m to the local economy, with an additional 30m gross tonnage (GT) of shipping traffic to the River Mersey. With our sights firmly set on the future, Liverpool Cruise Terminal is integral to making Liverpool a distinctive global city. Year on year we have seen a significant increase in the number of passenger ships berthed directly in our UNESCO World Heritage waterfront which is down to our sheer dedication to continually develop and invest in our cruise facilities, ensuring the best possible experience for our visitors. The next 5 years will see Liverpool Cruise Terminal undergo an extensive and exciting transformation, with our services relocated to the Princes Jetty at Princes Parade, giving us greater flexibility to accommodate 3,600 embarking passengers at any one time. compete on a world-class stage. During the 19th Century the Port of Liverpool was the world’s busiest and wealthiest port; over 9,000,000 people emigrated from the city to North America. The city has experienced a remarkable cultural and economic renaissance. There has been an unprecedented level of public and private sector investment that has transformed the city centre, delivering new cultural assets, shopping venues and transport infrastructure – Rough Guide stated we were in the Top 3 cities in the World to visit. Liverpool is an amazing paradox, it is a city bursting with energy and passion to be explored and enjoyed – not forgetting its inhabitants who are famously friendly and will welcome you with pride.